Does adding salt prevent boiling eggs from cracking? Why do some people poke a hole in the bottom of the egg before cooking it? How hot do eggs need to get to cook? There are a number of reasons why eggs can break when you boil them. Even if the shell looks whole, it may already have one or more micro-fractures already. Even if it is hard to see, the shell thickness is not uniform. Because the thickness is not consistent, some parts expand more than others and the resulting stress can lead to fractures. The greatest thermal stress occurs when a cold egg (from the fridge) is placed in boiling water. There is a small pocket of air at the bottom of an egg. The air pocket tends to be larger in older eggs1. As the egg heats up, the pocket of air expands and applies pressure to the shell. 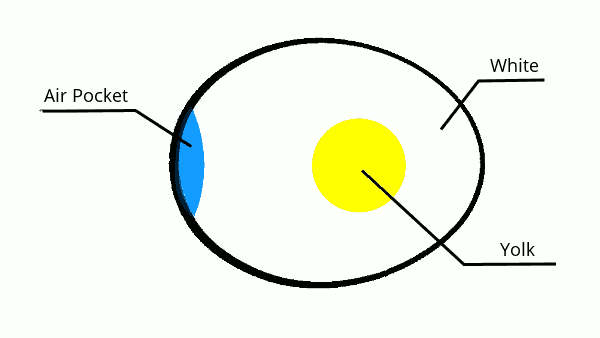 The shape of the egg is very strong against compressive forces, not so much against internal expansive forces. As the water boils, the egg is buffeted by the bubbles rising to the surface and causes it to knock about in the pot. If the boiling is very fierce the force of the egg hitting the pot can cause it to fracture. 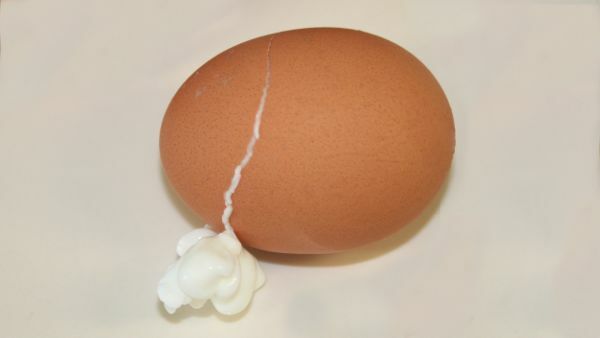 Several things can be done to minimize egg breakage during cooking. Reduce thermal stress. Place the eggs in cold water and bring to a boil. Reduce the pressure of the air pocket as it expands. Some people poke a small hole in the bottom of the egg to allow the air to escape when it expands2. Avoid cooking the eggs at a hard rolling boil. Eggs are composed of various proteins that set at slightly different temperatures, but they all set at 80°C – so once the water comes to a boil, you can reduce the temperature. Add some salt to the water. This doesn’t prevent the egg from breaking, but it quickly seals up any cracks because as soon at the egg white comes in contact with the hot salty water it solidifies. A bit of vinegar or lemon juice in the water will have the same effect. Boiling eggs in salty water reduces the risk of "cracked" eggs. Placing cold eggs in boiling water can cause stress fractures. 80°C is hot enough to cook an egg.